Surrounding hutong area. Staff very friendly and helpful. Assisted in onward travel arrangements. The entire staff -- Shower, Echo and Kin Shaw, was amazingly helpful. 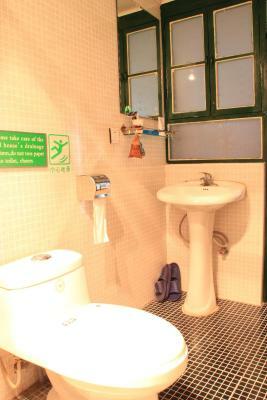 The location was great to experience the Beijing Hutongs plus, the cleanliness was uncompromised. P.S: Don't forget to try Echo's coffee during your stay. Highly recommend a stay here. Awesome staff. Really feels like a hutong. Great experience. close to historic attractions. Nice rooftop balcony. Staff(female )is willing to give a hand after we ask. It’s good value for limited budget traveler. In a great location, we loved the local cheap eats down the street. Staff friendly and helpful. Beds clean and comfortable. Well priced budget accommodation. The location is excellent! A really nice local experience. The staff are super friendly and helpful! Genuine hutong building within walking distance of three subway stations. Friendly helpful staff. Clean and quiet. Able to get washing done, room warm and shower hot. Excellent location - 10 minutes walk from Fuchengmen metro station along a tree lined road with lots of cheap and delicious food options. Lovely roof terrace and friendly helpful staff. 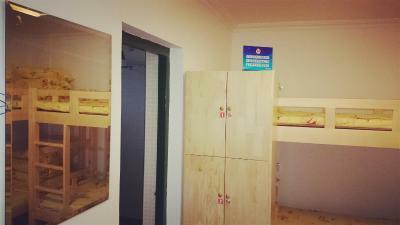 It has a good location in the cool Beijing alley area and is very close to the Forbidden City. It seemed to have a nice vibe with people playing the guitar for a while. One of our best sellers in Beijing! 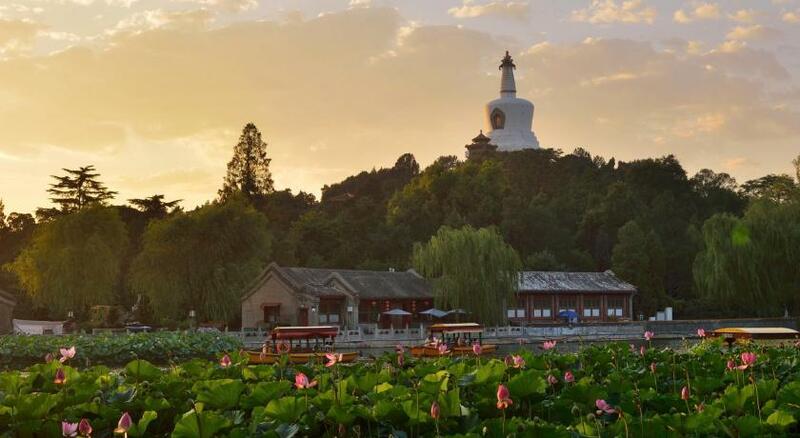 Beijing Templeside Courtyard Guest House is located less than 1.9 mi from Tiananmen Square and the Forbidden City. The hotel features traditional Chinese accommodations, free Wi-Fi and free neighborhood tours. 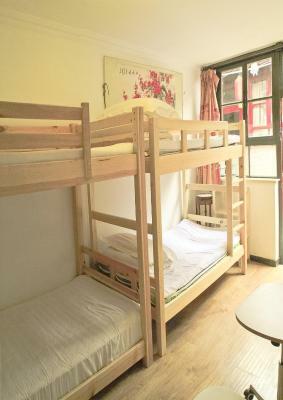 Beijing Templeside Courtyard Guest House is 16 mi from Beijing Capital International Airport. 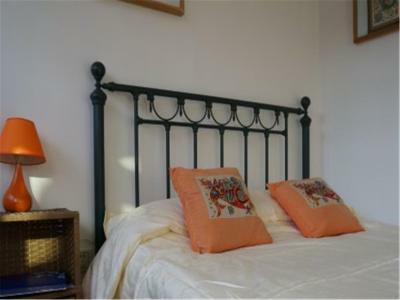 When would you like to stay at Beijing Templeside Lianlian Hutong Guest House? This dormitory features a balcony, electric kettle and air conditioning. 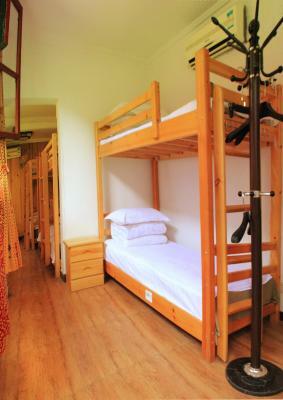 Please note that each bunk bed consists of 2 beds (an upper bed and a lower bed). House Rules Beijing Templeside Lianlian Hutong Guest House takes special requests – add in the next step! A CNY100 damage deposit is required on arrival (around USD14.91). This deposit will be fully refunded at check-out, as long as there isn't any damage to the property. Beijing Templeside Lianlian Hutong Guest House accepts these cards and reserves the right to temporarily hold an amount prior to arrival. Please inform Beijing Templeside Lianlian Hutong Guest House of your expected arrival time in advance. You can use the Special Requests box when booking, or contact the property directly using the contact details in your confirmation. A damage deposit of CNY 100 is required on arrival. That's about 14.91USD. This will be collected as a cash payment. You should be reimbursed on check-out. Your deposit will be refunded in full, in cash, subject to an inspection of the property. The room had nothing to do with the pictures. It was a room for 3 while we ordered a room for 4. Because we complained, we ended up with a very small room (bunk double bed). The floor was so dirty that we had to wear slippers all the time. Really not worth the price. The only thing we liked is the rooftop terrasse. Bathroom smelled a bit, but no worries. The facilities are poor. Strong smell in the bathroom and very little water pressure in the shower. Rather chilly in the room, too! Not ideal in -10 degrees. Noisy. Bit of a walk. Very basic. Not great facilities but cheap and cheerful. A better familiarisation of the area etc would have been helpful. Inorrectly directed to the not so convenient metro only to find a closer better connected one the next day. Some things not entirely working, but nothing extraordinarly necessary either. Comfortable and nice room, very cosy place. To get to the shared toilet and shower you need to go outside. An issue at night and when it is raining. The doors to the toilet and shower are glass. Not clear glass, I think it was sand blasted. But at night with lights in the shower, it is very embarrasing watching the silhouette of the person in the shower from the meeting room about a metre away. Even more embarassing taking a shower. Fairly expensive for not having a bathroom. My room was a bit odd since it was written as a single room but had a bunk bed and lockers when I got there. I was alone though. .bed sheets were not changed and not very clean. Not a calm hostel. Very helpful stuff. Provided help when needed and trying their best to communicate. Very nice location about 8 min walk to subway station. The neighborhood is very cute and the Hostel has a very unique architecture. The staff was helpful. but the great wall tour package offer by them was expensive then other. This property was nothing like what the pictures show. Do not stay here. Position not bad, but it does require a decent walk or taxi. Room not the cleanist I have seen. Seemed a quiet location. Staff were helpful. Was good to have the option of my own room. Bed bugs. Room dirty and not well maintained. Friendly staff, supermarket close by.